Over many years I have registered domain names for interesting topics, almost all of them about the future. Using these, I have launched a number of online publications over the years, including FutureofSex.net and Creating the Future of PR, among others. One of the possible paths for my business was to launch many future-oriented publications in parallel. I accumulated close to 400 domains to support possible projects. While I intend to be doing a lot more in publishing in years to come, my core business model is fundamentally shifting (more on that another time). As such, apart from a smaller collection of domains I will keep for my own projects, I am offering these domain names for sale. These domain names are perfect for thought leadership content projects. For example, one of the few domains I have sold was TheFutureofStrategy.com, which AT Kearney bought for a web publication featuring the firm’s thought leadership. I recently gave a series of opening keynotes on The Future of Customer Experience as part of a roadshow for omnichannel customer experience platform provider Genesys, which is running a global series of events for their lead customers, which includes organizations such as News Limited, Vodafone, Western Union, and the Australian Taxation Office. The central theme of my keynotes was the boundaries and relationship between humans and machines in customer experience. Today, extraordinary insights from data and analytics enable us to address individual’s unique preferences to an unprecedented degree. Yet the emotion, empathy and engagement of humans cannot be replaced – we all seek personal connection and a real sense of caring. Advanced Human Technologies Group has just launched Creating the Future of PR, a publication that looks at how the Public Relations industry can create an exceptional future for itself and its clients in a fast-changing world. The fundamental capabilities of PR professionals are more relevant than ever in our intensely networked world. 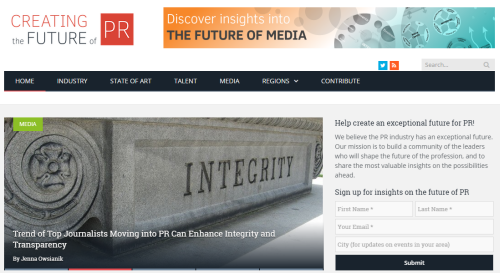 Arguably, PR should be at the center of the marketing universe, since it is better able than any other discipline to deal with a world driven by relationships, fueled by connectivity, social, mobile, and power shifting to the individual. 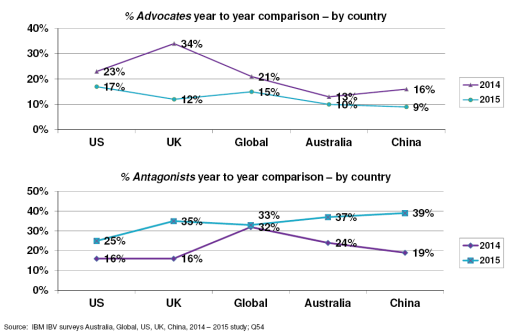 The big question is: will the PR industry seize the immense opportunity before it? Immediately after my opening keynote on Creating the Future of News at INMA World Congress in New York last week was a very interesting plenary session from Neil Zuckerman of Boston Consulting Group (BCG) on branded content in the future of media, drawing on a recent multi-country study they have done. I had already emphasized the importance of branded content in my keynote, so it was a great segue into his detailed analysis. 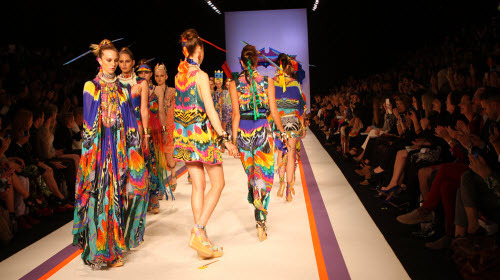 Zuckerman began by running through the severe challenges for the news industry, going on to highlight branded content as the next source of growth for the industry. Below are a few slides from his excellent presenatation. 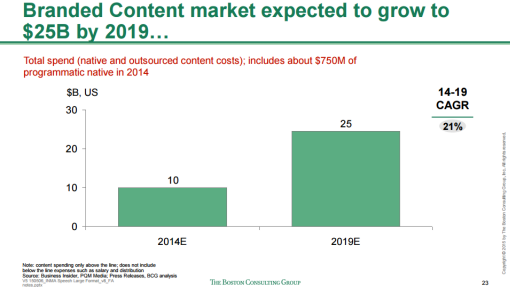 BCG sees branded content growing at a 21% rate over the next 5 years. I believe it is likely to grow faster than this. Tomorrow I am giving the opening keynote at International News Media Association (INMA) World Congress in New York. Over 400 senior news executives from 45 countries are gathering to gain insights into the leading edge and path forward for news organizations globally. 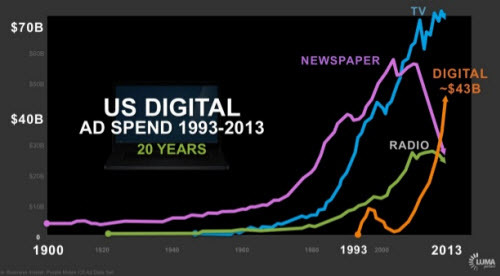 My keynote provides a highly positive perspective on the extraordinary opportunities for the news industry. I am currently refocusing on the future of news and media, and will be sharing a lot more on this topic during this year. For now, here are the slides to my keynote. As always, note that my slides are designed to accompany my keynote and not to stand alone, and also contain many videos that do not show in the slides below. However they may still be of interest to people who are not attending my keynote. Can Facebook-informed algorithms know you better than your mother? 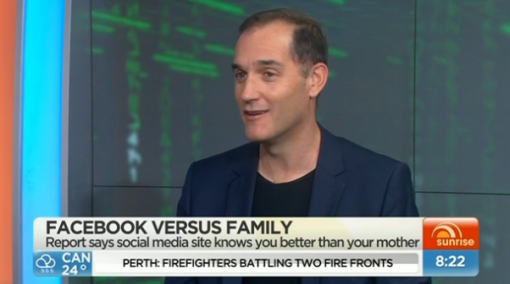 This morning I was interviewed on the national breakfast program Sunrise about whether algorithms can assess our personality better than those who are closest to us. Click on the image below to view the segment. The personality-assessment algorithm was solely based on Facebook likes made by participants, with results compared to the assessments of people who know them well. As little as 150 likes was sufficient to provide a more accurate personality assessment than a family member such as a parent, while 300 likes enabled a better assessment than a spouse. Being able to interact with people in a way tailored to their personalities and designed to generate particular responses is certainly a fair way beyond being able to assess personalities accurately, but we are rapidly heading in that direction. These findings are unlikely to give pause to people sharing their lives – and personalities – on social media, but we absolutely need to be aware quite how deep the insights about ourselves we are sharing in our everyday online behaviors. https://rossdawson.com/wp-content/uploads/2016/07/rdawson_1500x500_rgb-300x100.png 0 0 Ross Dawson https://rossdawson.com/wp-content/uploads/2016/07/rdawson_1500x500_rgb-300x100.png Ross Dawson2015-01-13 11:46:092015-01-13 11:46:09Can Facebook-informed algorithms know you better than your mother? John Winsor, CEO of crowdsourcing-based advertising agency Victors & Spoils and Chief Innovation Officer at global marketing conglomerate Havas, has long been an innovator and provocateur in agency world. He gave the keynote at the Future of Crowdsourcing Summit I ran in San Francisco and Sydney in 2010, and his agency was featured as a case study of crowd business models in my book Getting Results From Crowds. John has just published an excellent article on HBR Blogs titled The Future of Marketing, as Seen at Cannes Lions. How will TV and digital video converge and who will take the bulk of the value? While news-on-paper is on the way out, it appears to be quite a different story for TV. The TV industry globally is challenged in a variety of ways, however revenues in the US remain resilient, as shown in this chart. Digital video has exploded over the last 8 years however that has, in the main, being a complement to TV, with TV viewing eroding surprisingly slowly compared to earlier forecasts. https://rossdawson.com/wp-content/uploads/2016/07/rdawson_1500x500_rgb-300x100.png 0 0 Ross Dawson https://rossdawson.com/wp-content/uploads/2016/07/rdawson_1500x500_rgb-300x100.png Ross Dawson2014-07-10 12:59:012014-07-10 12:59:01How will TV and digital video converge and who will take the bulk of the value?